The portable Garmin StreetPilot c510 comes preprogrammed with regional European map data, and includes automatic routing, and 2D or 3D map perspective, making navigation easy. It also accepts customised points of interest (POIs) such as school zones and speed cameras. Garmin StreetPilot c510 has been discontinued. Accessories, spares and parts are still available for your StreetPilot C510, as are road maps. The Garmin StreetPilot c510 includes an automotive-grade, sunlight-readable, anti-glare display and features autorouting. The Garmin Lock anti-theft feature disables the unit from performing any functions until you type in a specific 4-digit PIN or take the unit to a predetermined location. The Garmin StreetPilot c510 also accepts customized points of interest (POIs) such as school zones and speed cameras. Also receive optional FM TMC traffic alerts with the purchase of an integrated traffic receiver. ‣SD memory card expansion slot. The new Garmin StreetPilot c-series boasts distinctive and sleek styling - the only buttons are a rotary volume knob and an on/off switch. The Garmin StreetPilot c510 GPS device is secured by a suction-mount cradle that fastens to the windshield for easy portability between vehicles. Users can customize their unit's appearance with an array of colored faceplates (sold separately). The Garmin StreetPilot c510 inlcudes Navteq maps and provides detailed maps of UK and Ireland. Navteq maps provide high quality, detail rich maps, which in addition to street information include features such as route calculation, Points of Interest, Estimated Time of Arrival, and more. Looking for accessories and spares for the Garmin StreetPilot c510 view them all here. 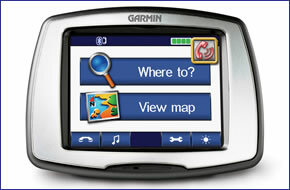 All parts are genuine Garmin product and specifically designed for use with the StreetPilot c510 sat nav.